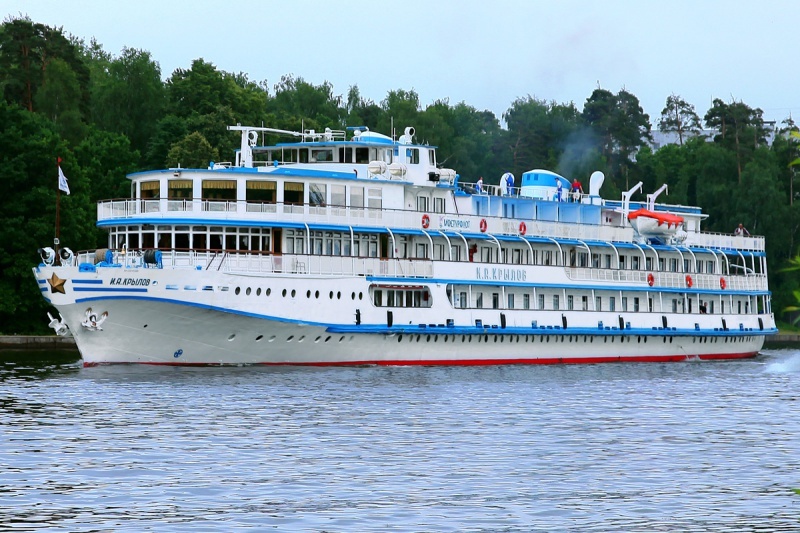 This motor ship with three decks (Project 588) was built in Germany and features modern navigation equipment. 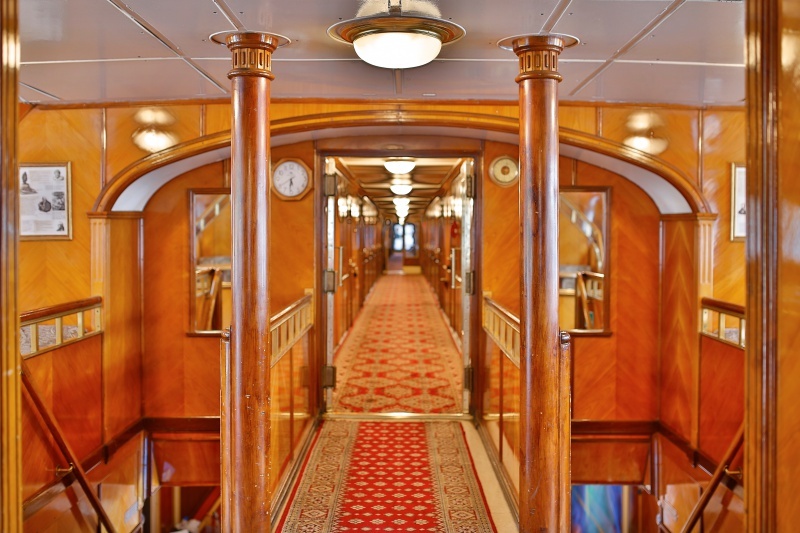 Length – 96,3 meters, draft – 2,45 meters, width – 14,3 m. The ship can accelerate to 23,7 km/h. Engine output – 1200 HP. 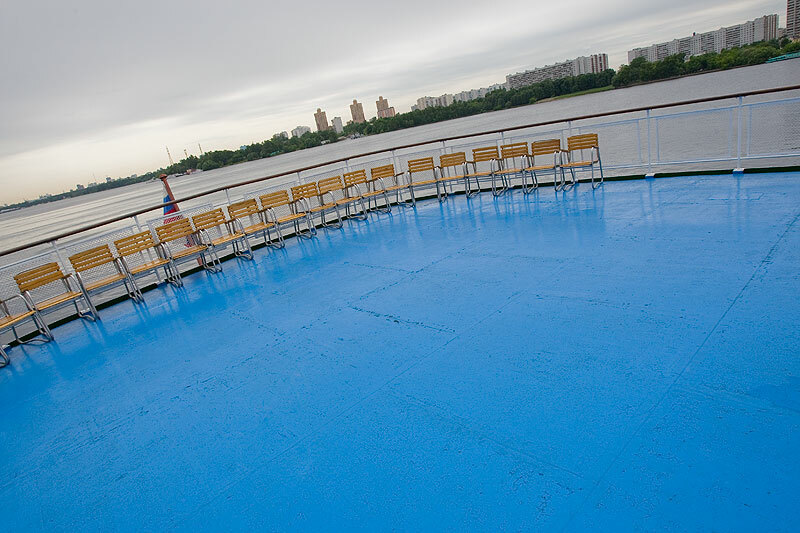 Maximum capacity – 210 passengers and 75 crewmembers. 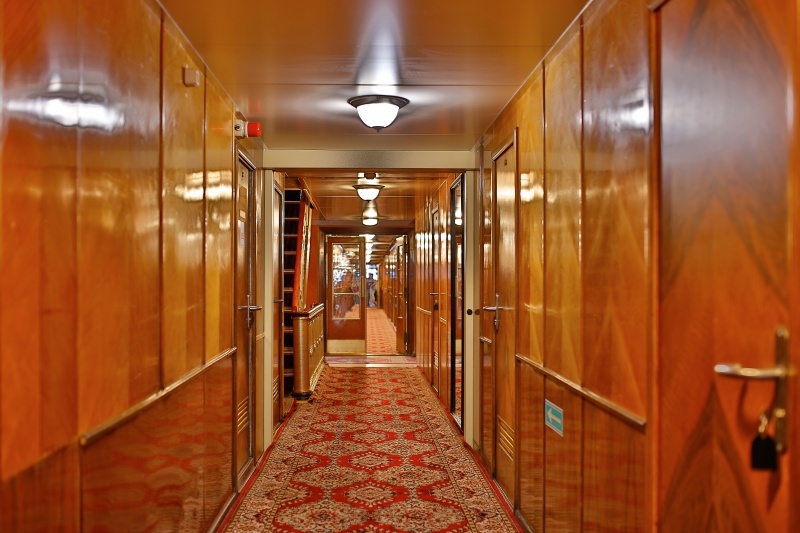 The main feature of the vessel is the vintage design of the cabins and public spaces, including exquisite wood finishing, that was completely preserved after the renovation of the ship interior that resulted in an elevated level of comfort for the passengers. 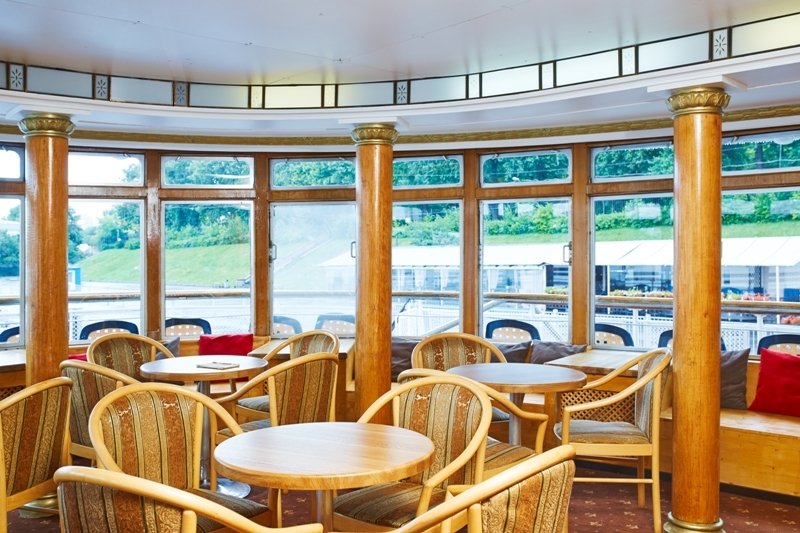 2, 3 and 4 berth cabins are available on the boat, middle, main and lower decks. 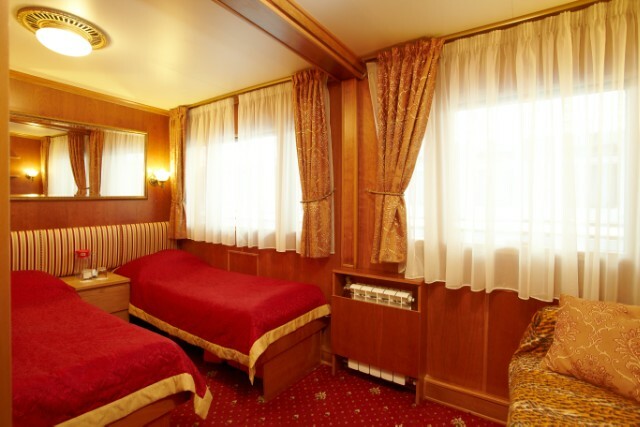 Cabins with a superior level of comfort are available, including Semi-Suite and Suite options. 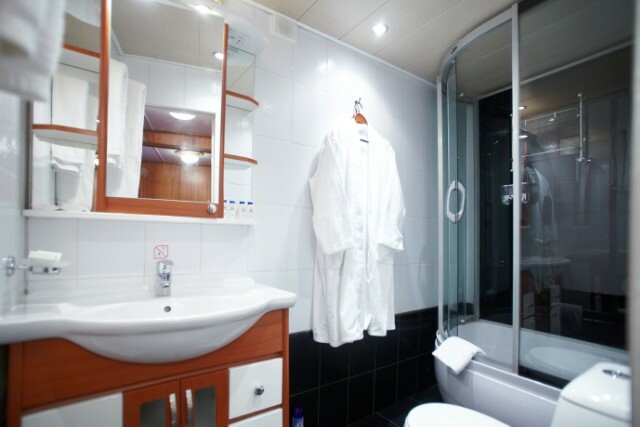 All Semi-Suite and Suite cabins come with a bathroom, balcony, satellite television, air conditioner, individual phone line and hair dryer. 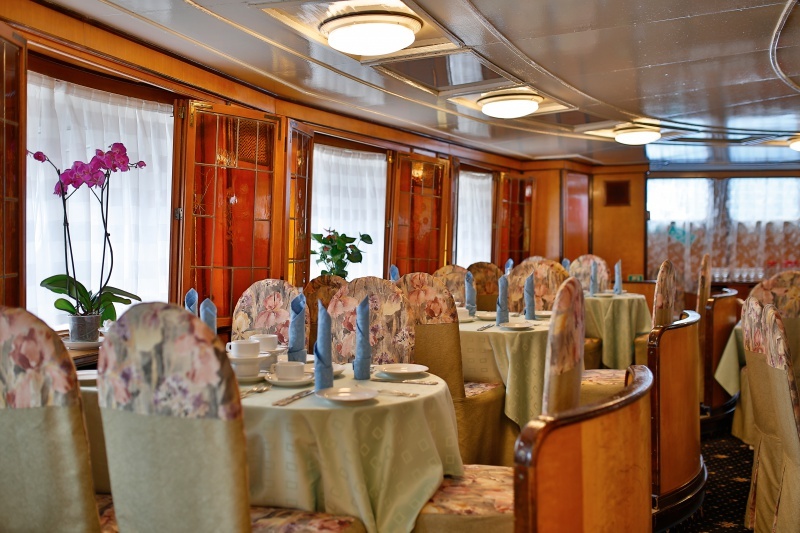 There are two restaurants on board serving breakfast, à la carte lunch: a selection from a list of 2 first courses, 3 second courses (one of which is vegetarian), 2 desserts and à la carte dinner with a choice from a list of 2 dishes and 2 desserts. 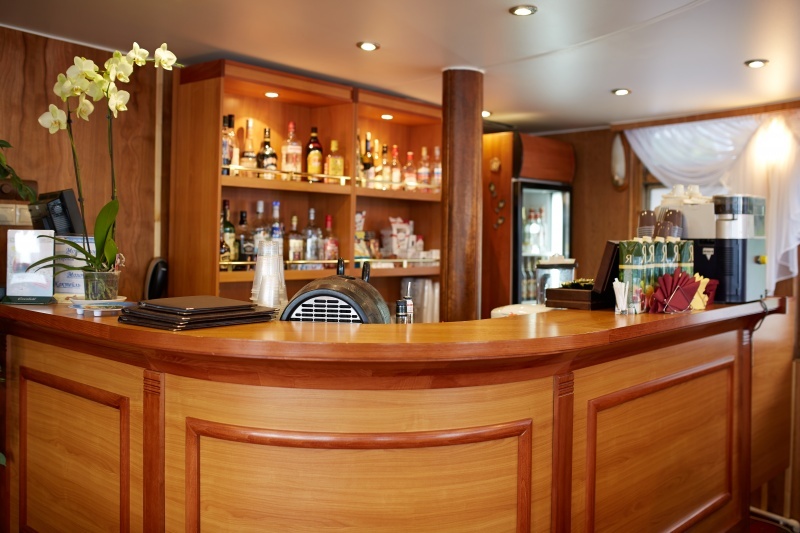 Drinks on us every dinner: your choice of a glass of red/white wine, a shot of vodka, a glass of beer or juice. 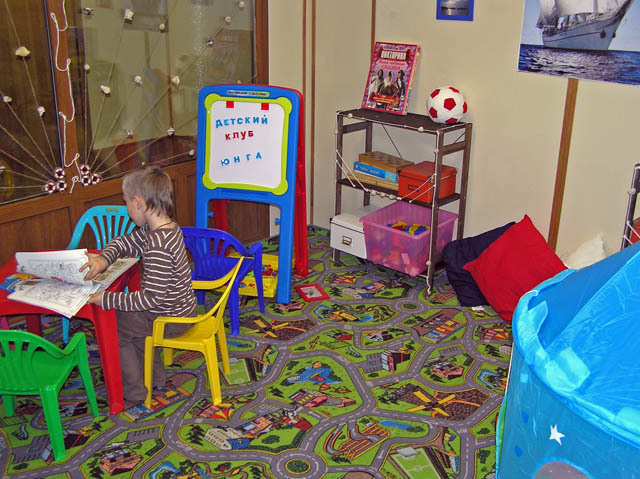 We offer high chairs and a custom menu for kids. 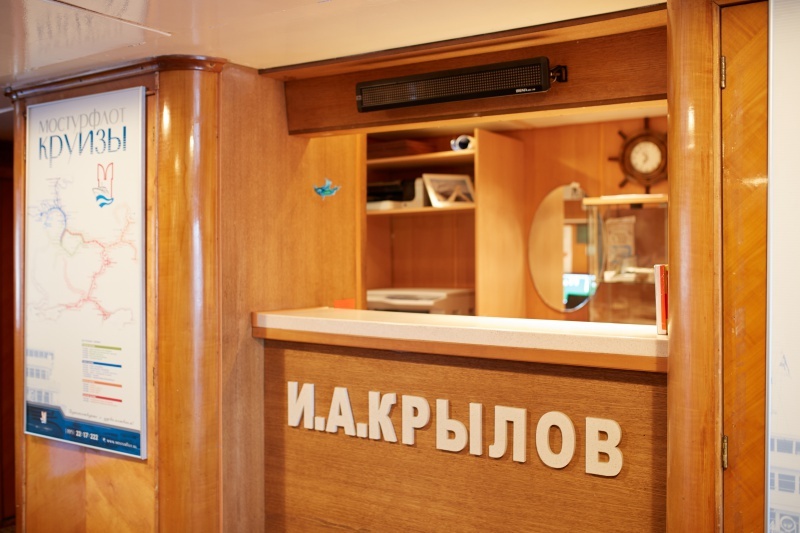 The ship features a music room, a cinema, a clinic, an ironing room and a kid’s room. We organize music and entertainment events. There are TVs in the bar and lounge. Among the many other facilities there is a library; sun lounges, sports and fitness equipment rental, daily housekeeping services etc. 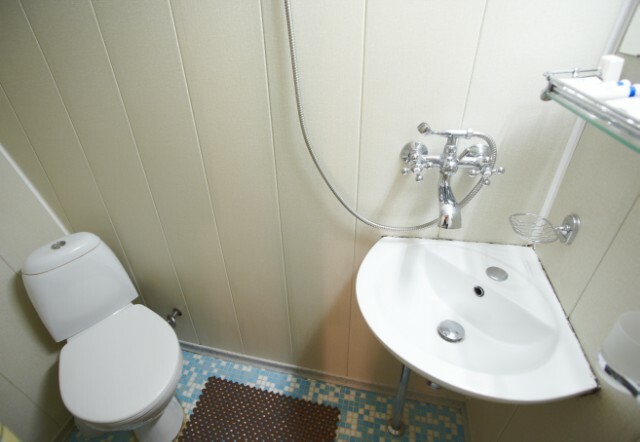 All cabins come complete with toiletries. It is also possible to participate in our fitness program that takes place every morning. 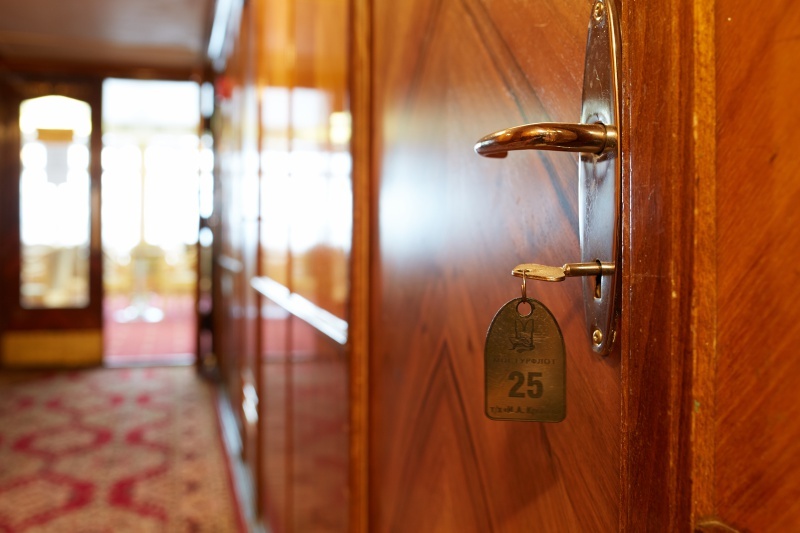 The following services are available for an additional fee: mini-bar, laundry, safe at reception, souvenirs, office services and taxi services. 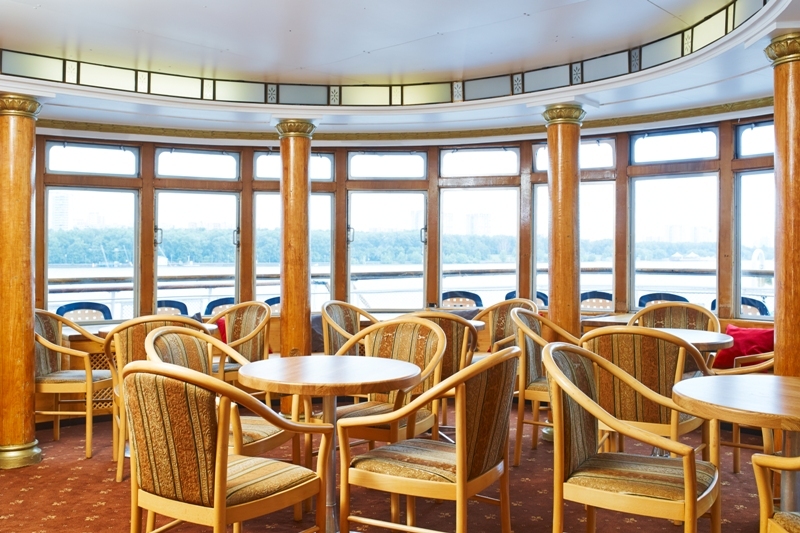 There is free Wi-Fi access in all public areas. 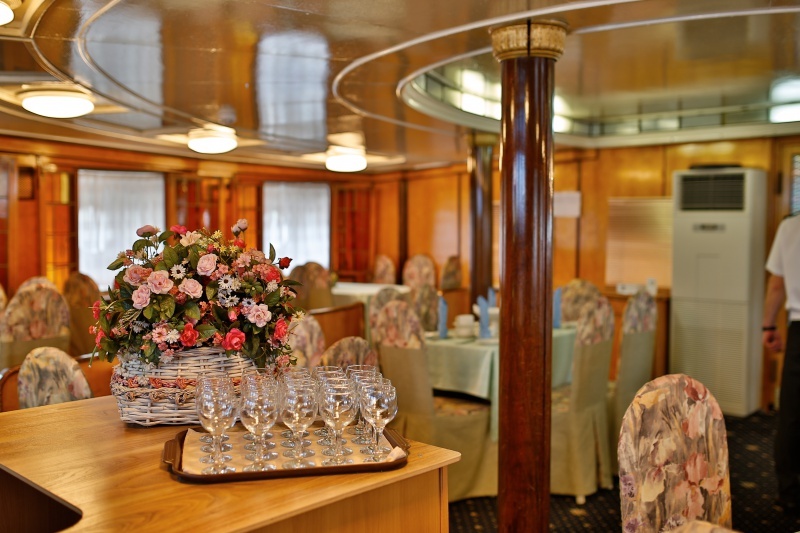 In preparation for the 2015 navigation season a large amount of work was carried out on the ship. Many components of the main engines were replaced. 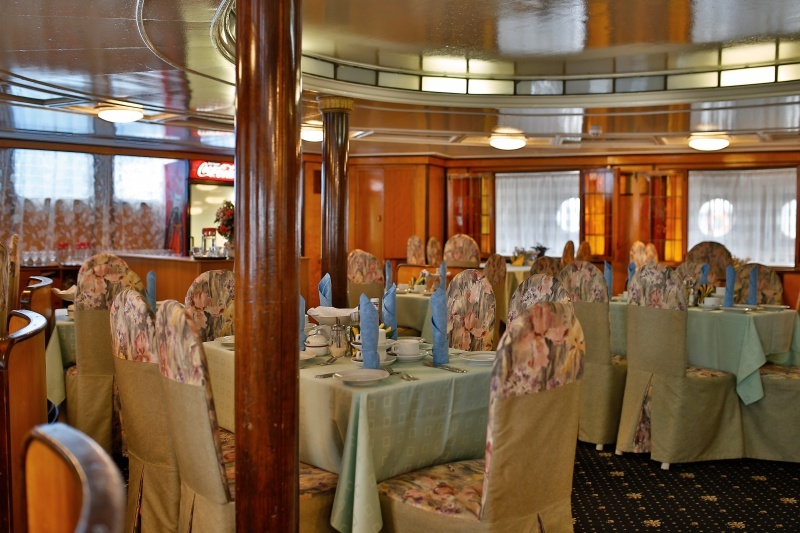 The restaurant on board was completely renovated, its dining space was increased. 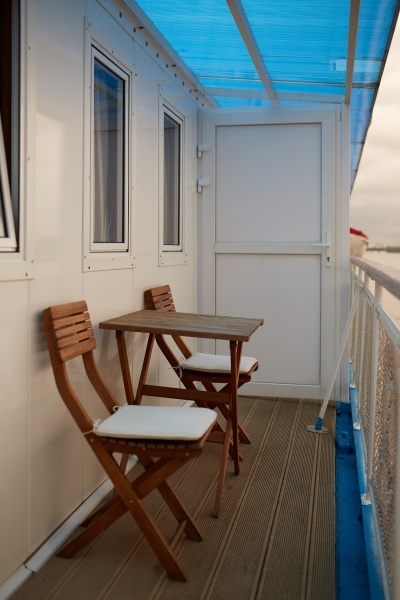 Three new cabins with balconies were added on the right side of the boat deck: #1, 3 and 5. 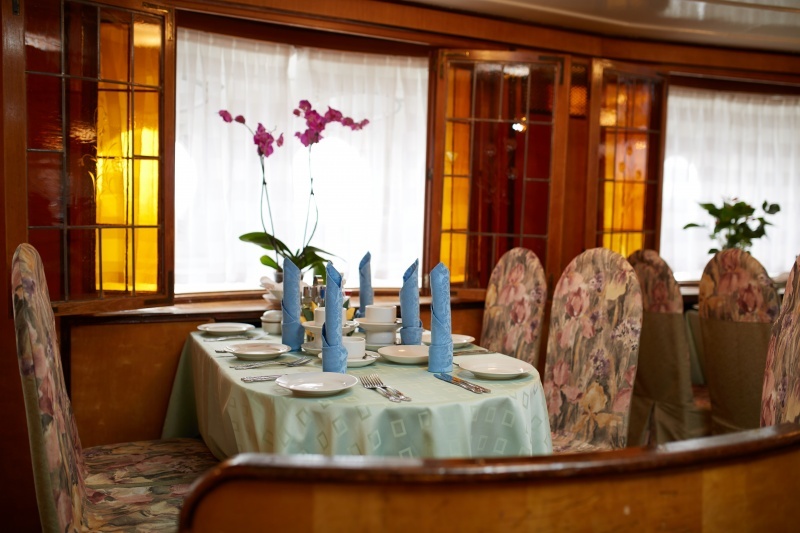 The cabins are fully equipped with all the necessary amenities and boast a modern decor and layout. 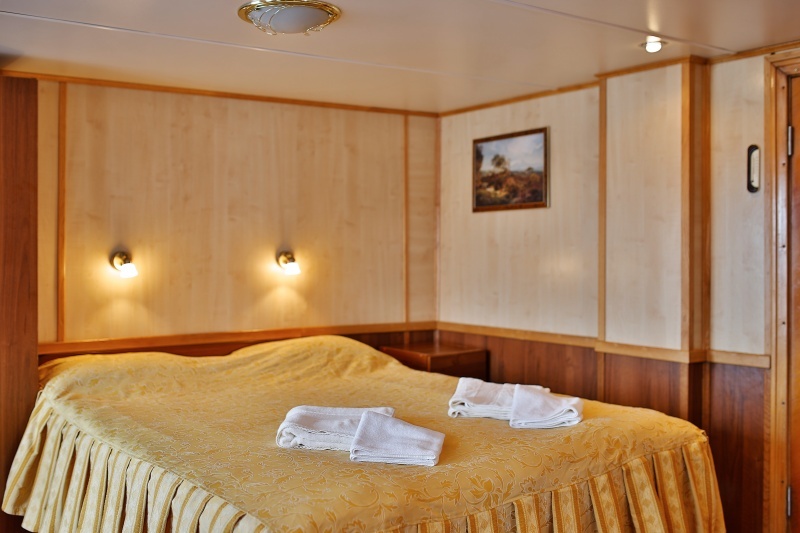 Each cabin includes a double bed (or two single beds on request), shower, toilet, fridge, air-conditioning, closet, TV, hair dryer, phone and balcony. 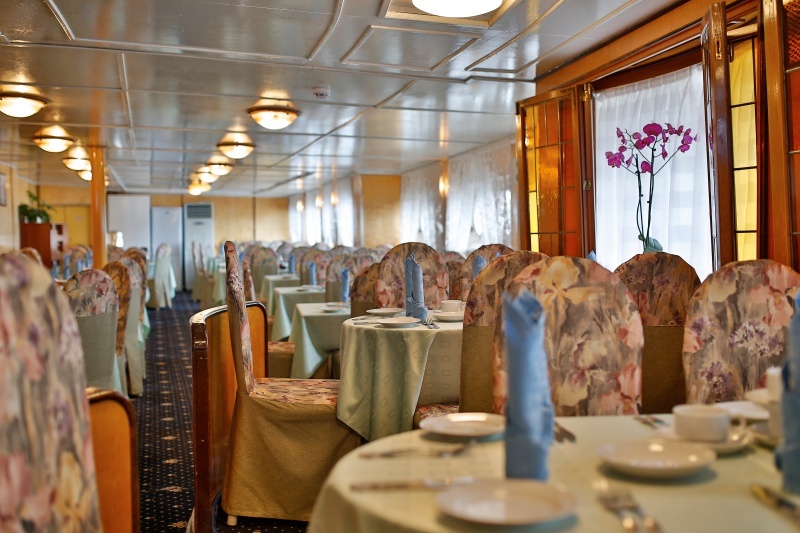 Embarkation since 4:00 p.m. Ship departure at 7:00 p.m. (dinner). Return to the boat after the tour to Mandrogy. 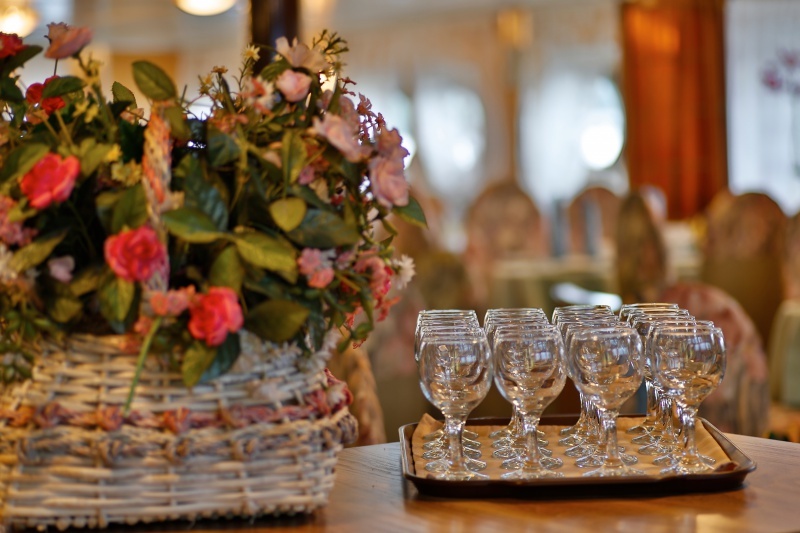 Things to do: try the famous pirozhki (stuffed buns) with a revitalizing herbal tea, feed the horses in the stables, have a horse ride - horseback or carriage-drawn. 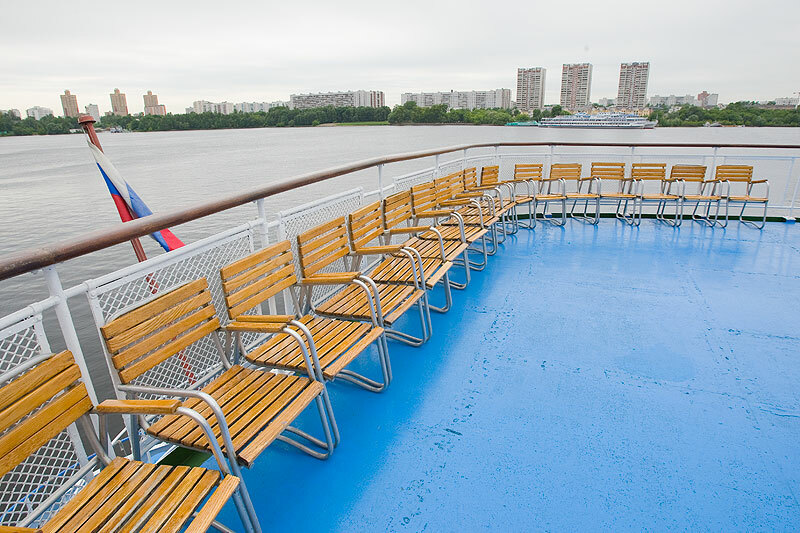 At your choice: 1) Walking tour “Masterpieces of Kizhi Island”. During the tour you will see the unique multi-domed churches and their icons, examine a house of a Zaonezhie peasant, enjoy the chimes of Archangel Michael chapel and see the Church of the Resurrection of Lazarus - the oldest wooden church in Russia. 2) Walking tour “Villages of Kizhi Island”. A fascinating trip to the central part of the island to visit the ancient Kizhi villages Yamka and Vasilyevo. In the Vasilyevo village, you will see the largest and most beautiful wooden house of the island, richly decorated with carvings, the Mother of God Assumption chapel, and climb the Naryina Mount - the highest point of the island. In the village of Yamka you will explore one of the 19th century houses and learn about the peasant life of the past, as well as the experiences of the Zaonezhie villagers today. Special tour program “Historic Restorations Works”. The Preobrazhensky (Transfiguration of the Saviour) Church is conducting restoration works unprecedented in their complexity - the temple is mounted on lifting supports - it's practically "floating" in the air. Excursion to the Carpenter’s Center, an area traditionally closed to the public. Program “Villages of Kizhi” in a horse-driven cart. Interactive folk program ”Music of the Northern Village”. This program gives you the opportunity to experience the diversity of folk traditions - it’s time for a party! Visit a Zaonezhie get together: listen to epics, religious poems, and lingering northern songs. Kizhi Island Pharmaceutical Garden tour. Tour length – 45 minutes. Group size: 5+. 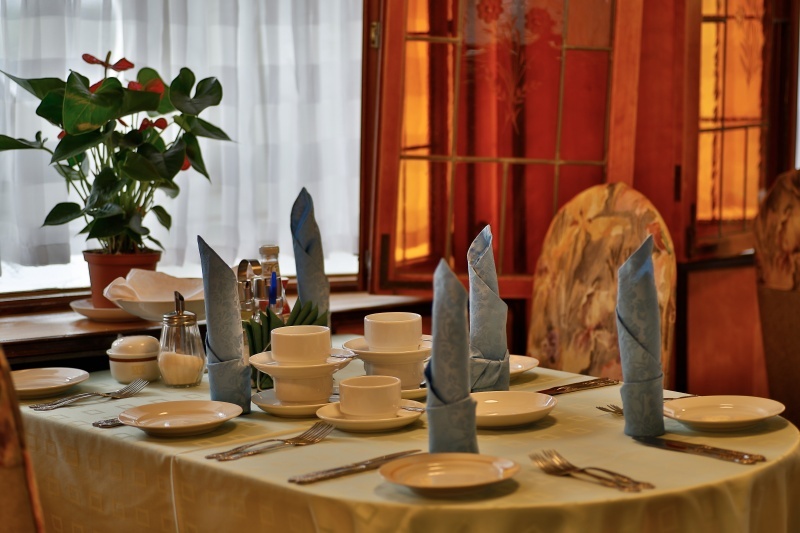 Traditional Karelian Cuisine Tour. Traditional Karelian Pastry Master Class. Tour length – 90 minutes. Group size: 3-15 people. 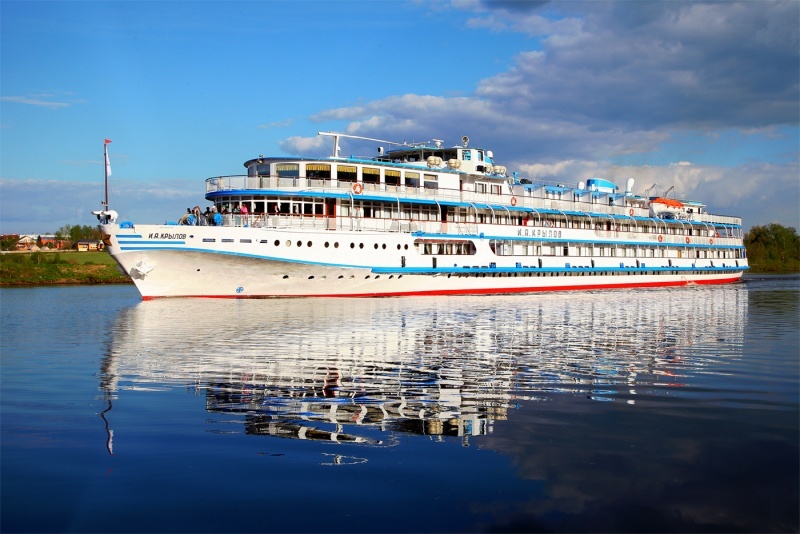 Excursion package of your choice: 1) Petrozavodsk City Tour. Take a walk along the embankment to have a peek of the sculptures donated by Petrazavodsk’s twin cities in Sweden, Finland, Germany, France and the USA. 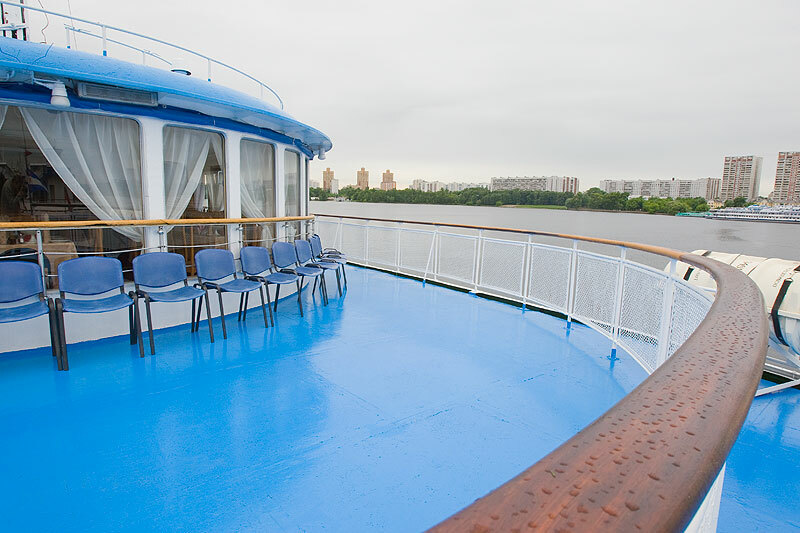 See the monument to the founder of Petrozavodsk Peter the Great, the historic downtown, the Theater Square, the Music Theater and the National Theater. Tour length – 2½-3 hours. 2) City Tour. Take a walk along the embankment to have a peek of the sculptures donated by Petrazavodsk’s twin cities in Sweden, Finland, Germany, France and the USA. 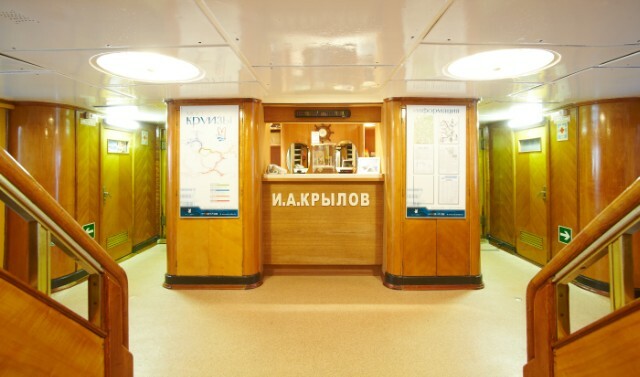 Visit the National Museum of the Republic of Karelia. Tour length – 3 hours. 3) Pedestrian City Tour. Take a walk along the embankment to have a peek of the sculptures donated by Petrazavodsk’s twin cities in Sweden, Finland, Germany, France and the USA. 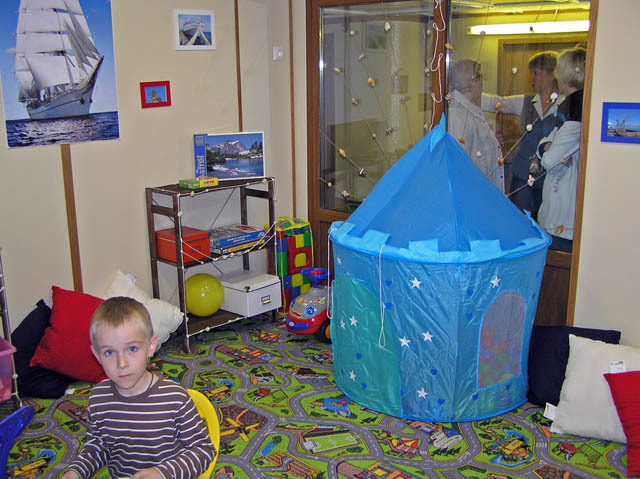 Visit the Museum of Fine Arts of the Republic of Karelia. (icon-painting of the 15-19th centuries, folk art, national costume, embroidery, weaving, carving, painting on wood, birchbark, copper and ceramic utensil collections dating from the 19-20th centuries, Russian Art Fund: paintings by Levitan, Polenov, Korovin, Meshersky, Aivazovsky). Tour length – 3 hours. Bus tour “Kivach Falls” with a tour of the main sights of Petrozavodsk. Tour length - 5 hours. Kivach Falls bus tour with a visit to the main sights of Petrozavodsk. Stop at the Siberian Husky kennel and discover the joys of dog sled racing. Real Siberian huskies, calm and strong, are a representation of the Northern nature. The kennel dogs are champions and participants of the most famous long races in Russia and abroad. Tour length – 5 hours. 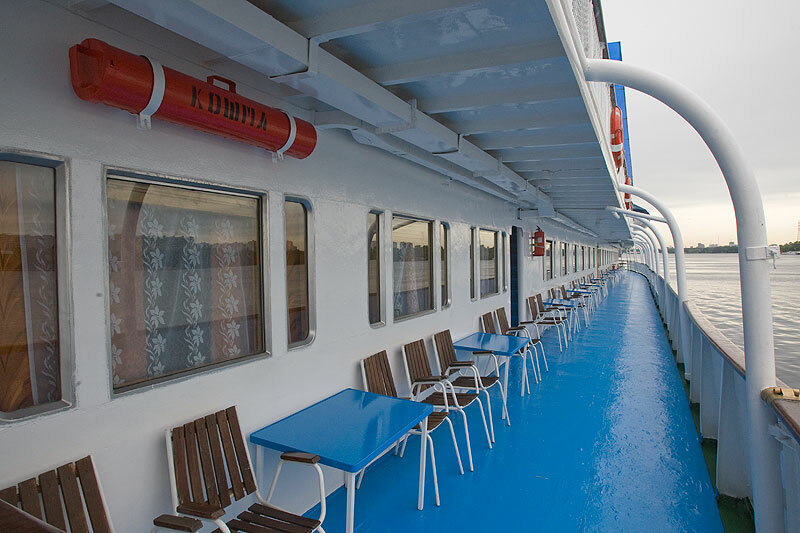 Rafting on the Shuya river with a tour of the main sights of Petrozavodsk. Tour length - 5 hours. 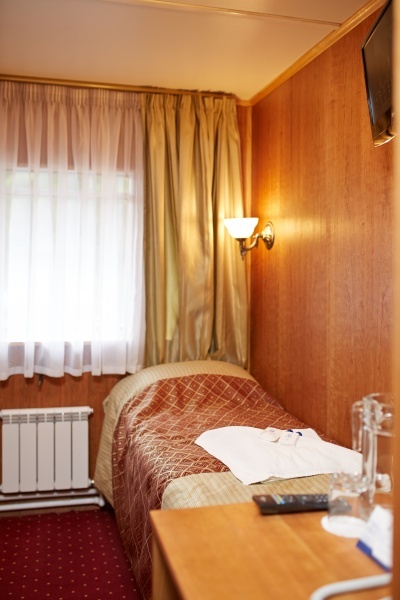 Additional Excursion: Petrazavodsk City Bus tour with a stop at the House of Shungite Stone. Tour length – 3 hours. 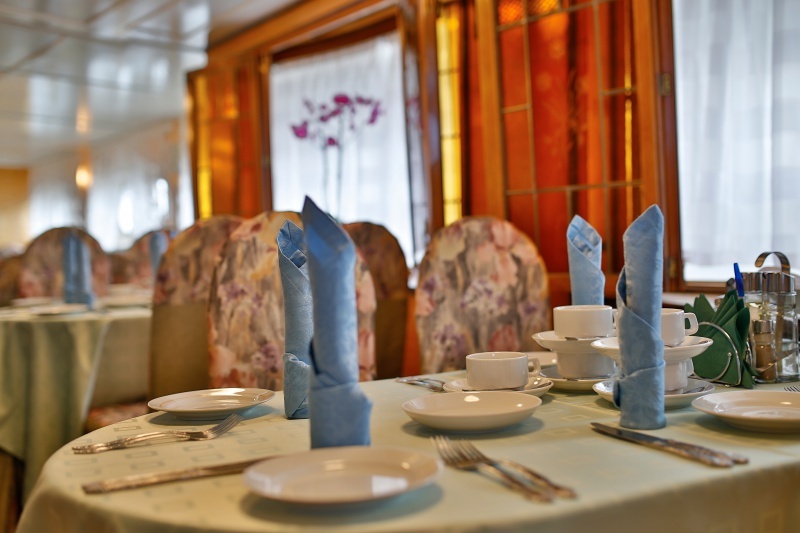 Ship arrival at 08:00 p.m. (dinner) at the North River Terminal. 29a Oktiabrskaya Nab. 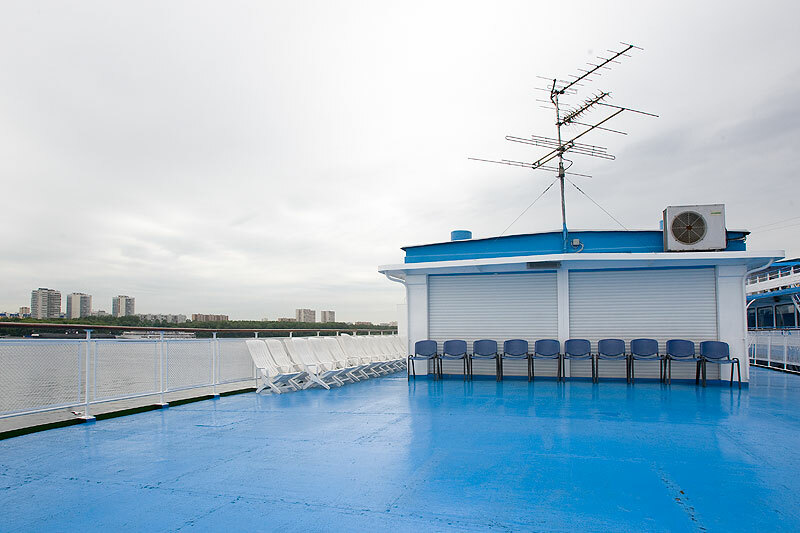 (embankment), St. Petersburg, from Lomonosovskaya metro station by taxi-minibuses No. 476, 119 to “Salt Pier” (stop on demand) or by any other taxi-minibus headed towards the Cable Stay Bridge via Volodarsy bridge. 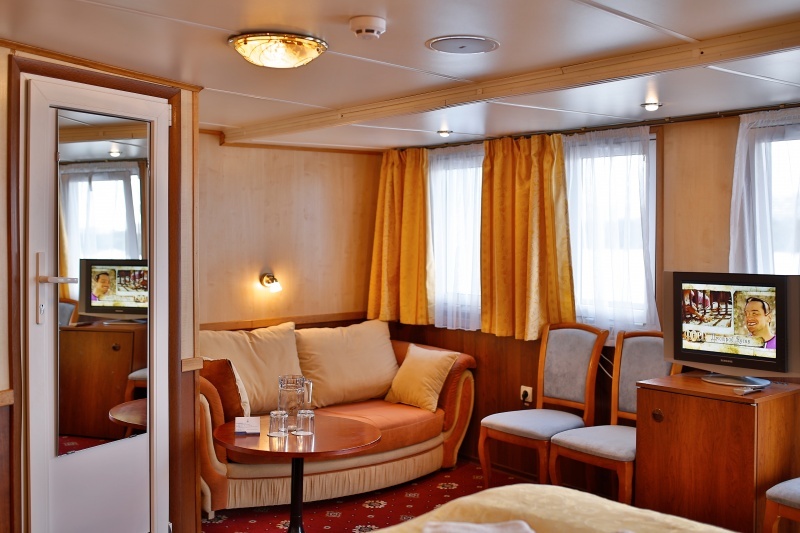 Additional payment for double berth accommodation in triple single-story cabins of category 1B (No,50, 72, 73) is 65% of the cost of the main berthing space. 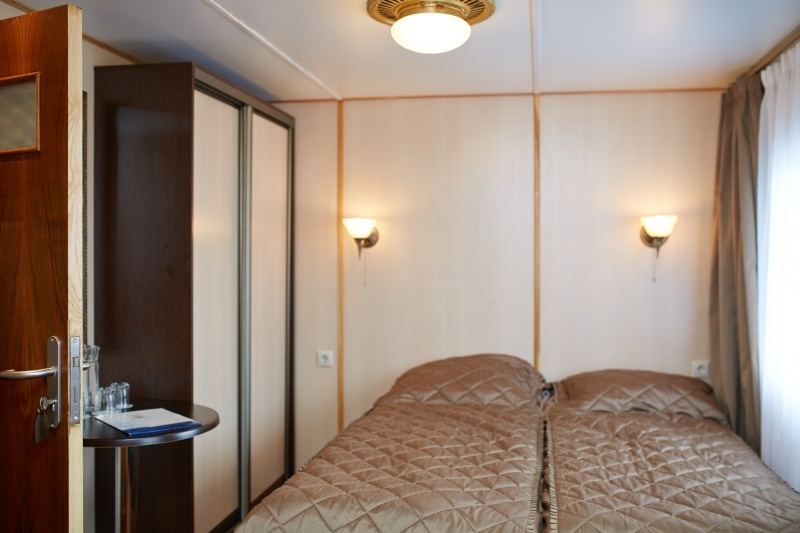 201 – Each cabin includes two single beds, a couch, fridge, TV, air conditioner, a balcony, a spacious restroom (shower, washbasin and toilet), hair dryer, and an individual phone line. 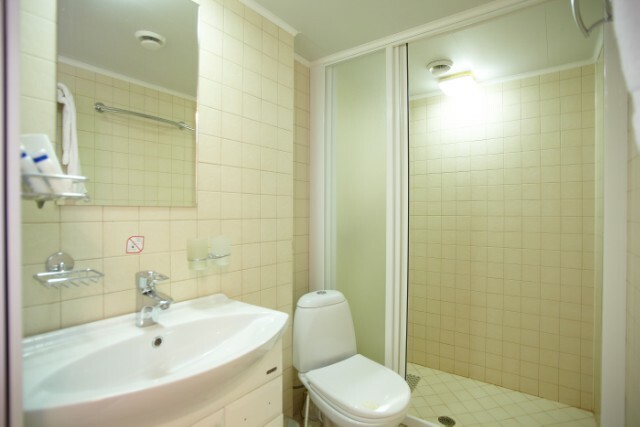 4 – The cabin include a double bed, a couch, fridge, air conditioner, a balcony, a restroom (washbasin, shower, and toilet), hair dryer and an individual phone line. 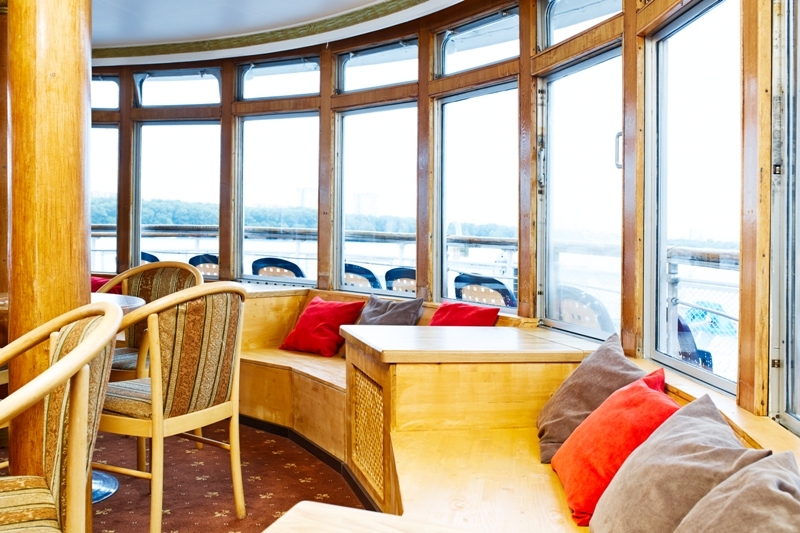 3, 5 – located on the boat deck, 10.6 square meters. 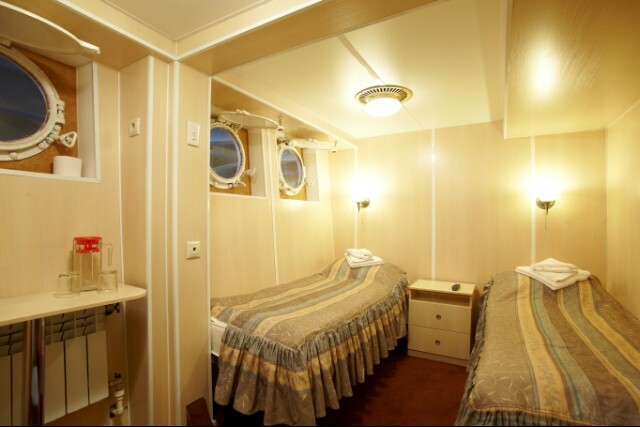 Each cabin includes a double bed (or two single beds on request), a shower, a toilet, fridge, air conditioner, a closet, hair dryer, individual phone line and a balcony. 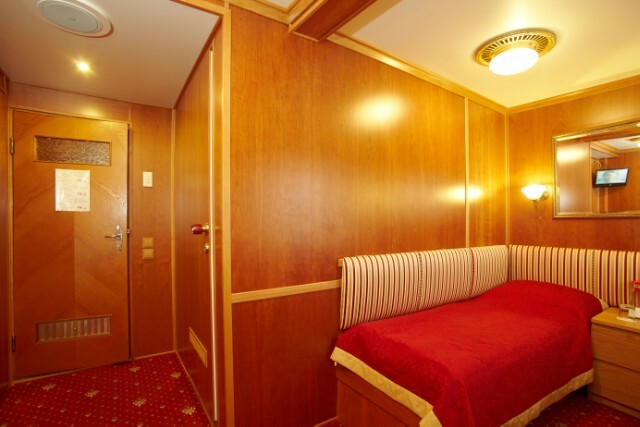 Single cabin located on the middle deck. 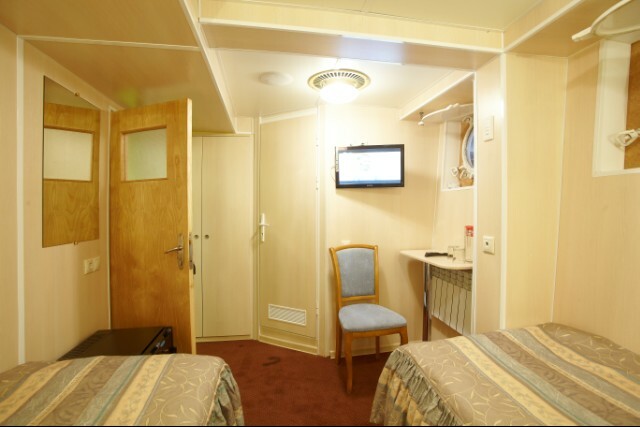 The cabin includes a single bed, restroom (washbasin, shower and toilet), TV, air conditioner, hair dryer, individual phone line. 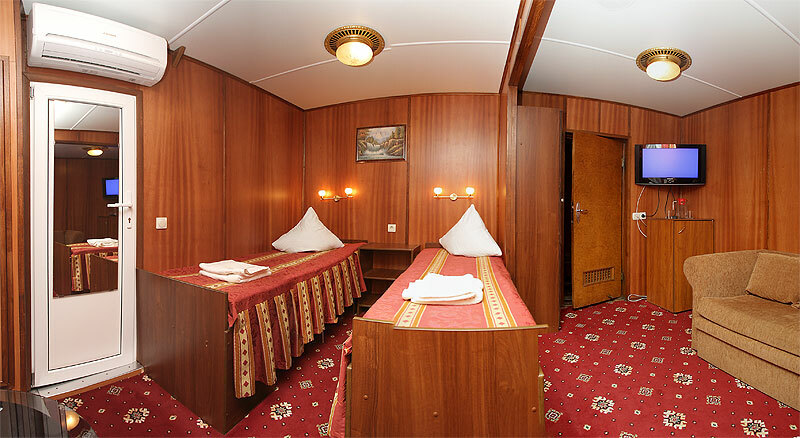 In cabins 54, 55 there is an extra couch (for children only). 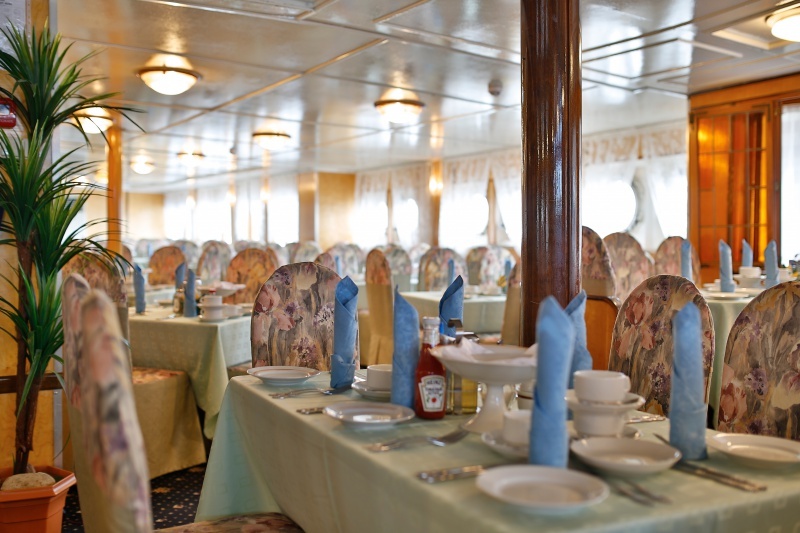 29, 32 – located on the middle deck. 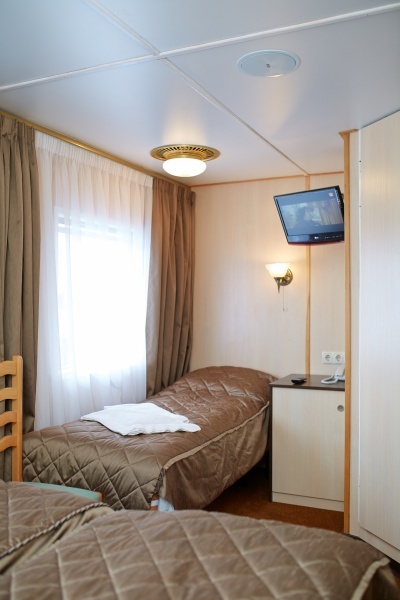 Each cabin includes two single beds, a pullout couch (193*120 centimeters), shower, toilet, fridge, TV, air conditioner, hair dryer and an individual phone line. 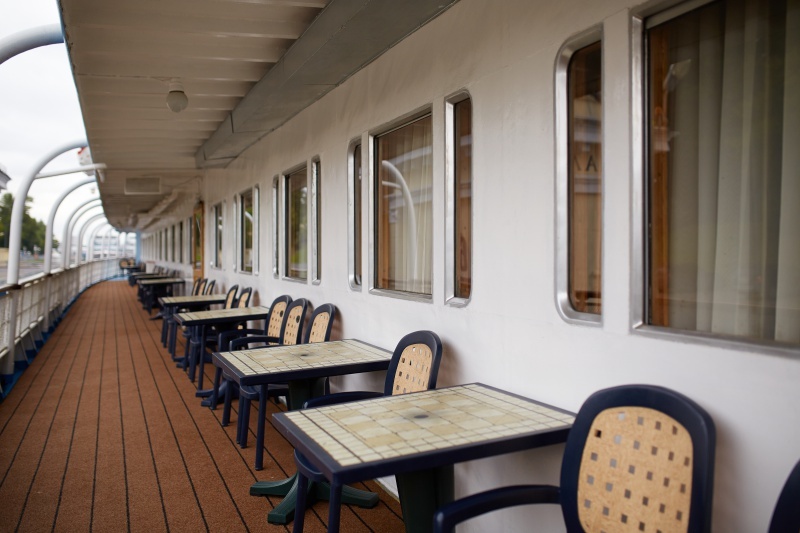 47 – located on the middle deck. 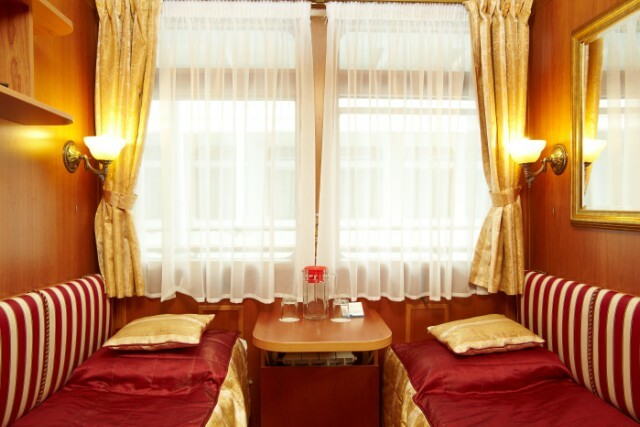 The cabin includes two single beds, a pullout couch, shower, toilet, fridge, TV, air conditioner, hair dryer, and an individual phone line. 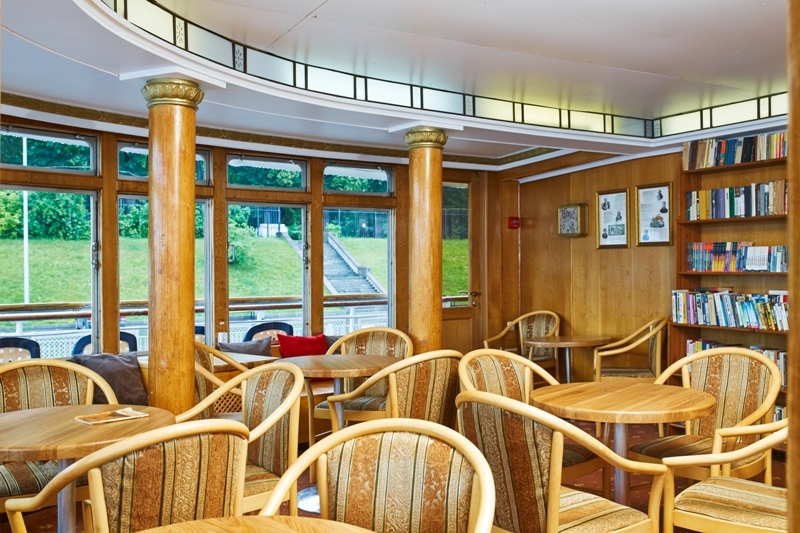 49 – located on the middle deck. 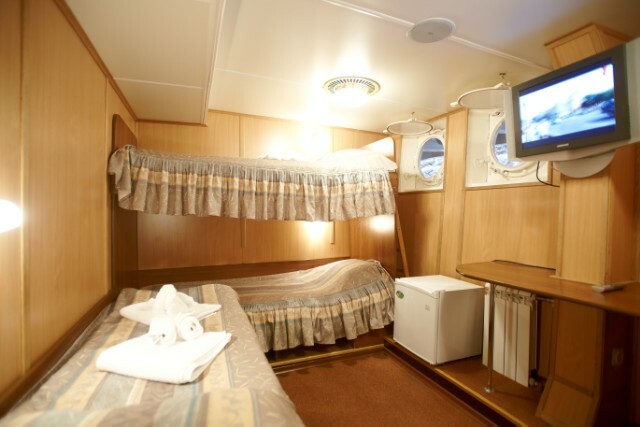 The cabin includes two single beds, shower, toilet, fridge, TV, air conditioner, hair dryer, and an individual phone line. 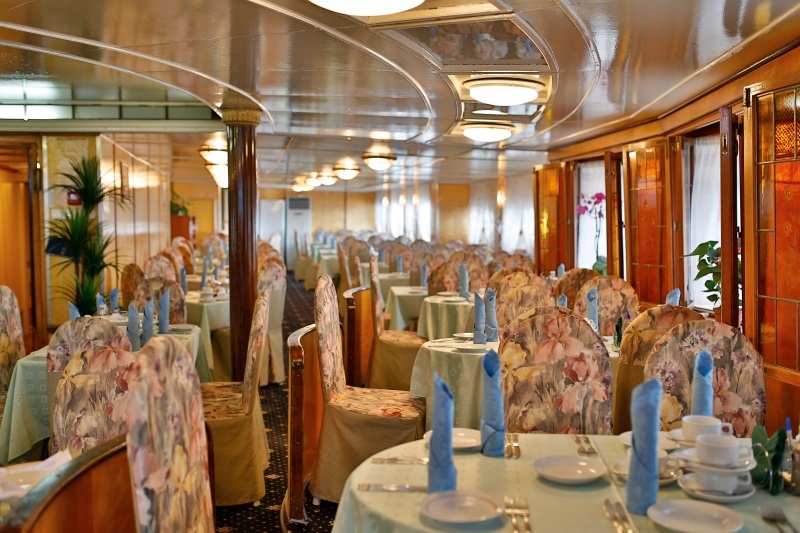 # 20-25, 31, 33-44, 46, 50, 51, 56-60 are located on the middle deck. 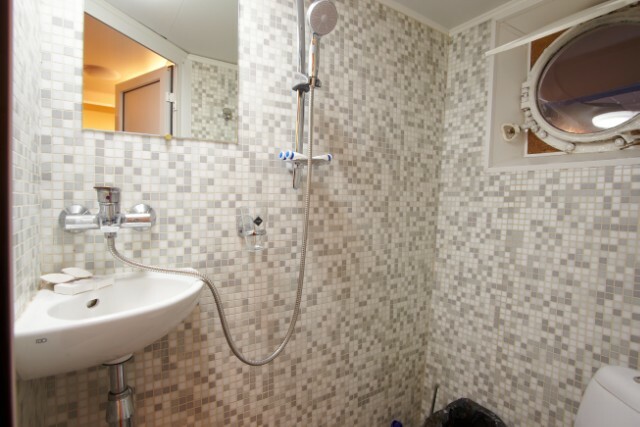 The cabins include: two single beds, restroom (washbasin, shower and toilet), toiletries (shampoo, gel, shower cap), TV, central individually adjustable air conditioning, hair dryer, individual phone line. Cabins # 50, 51, 53, 56-60 also include a fridge. 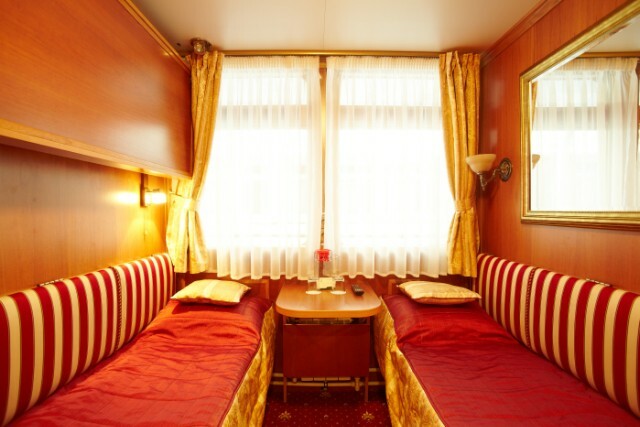 There is an extra chair-bed in cabin 53 (dimensions: H70 x L190 cm). 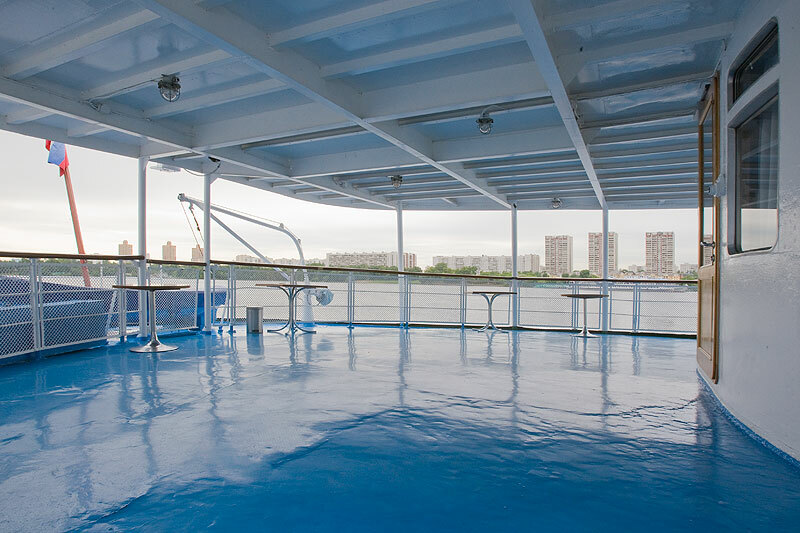 #26, 28 – two-level cabins, located on the middle deck, at the bow. 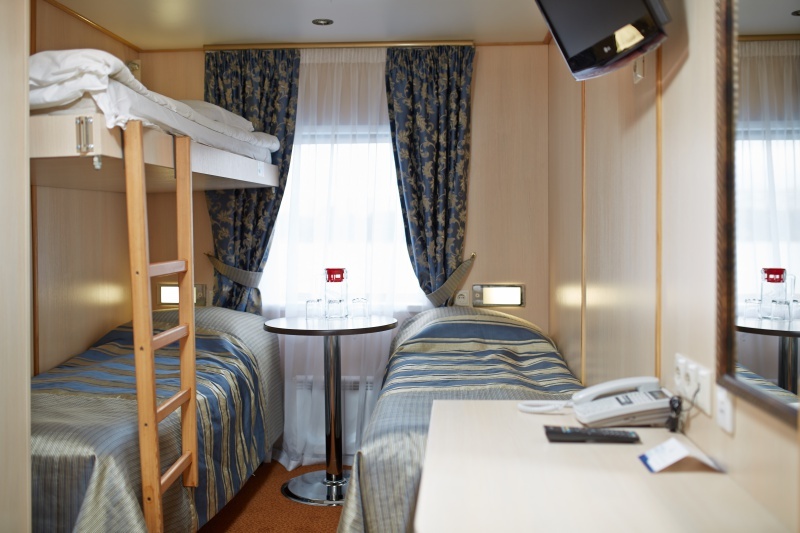 Each cabin includes two single beds and a top bunk, restroom (washbasin, shower and toilet), toiletries (shampoo, gel, shower cap), TV, central individually adjustable air conditioning, hair dryer, individual phone line. 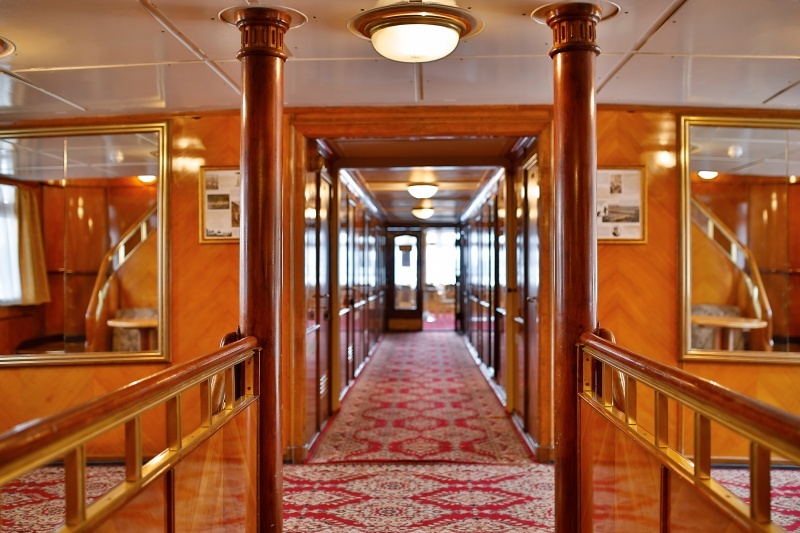 # 72, 73 are located on the main deck. 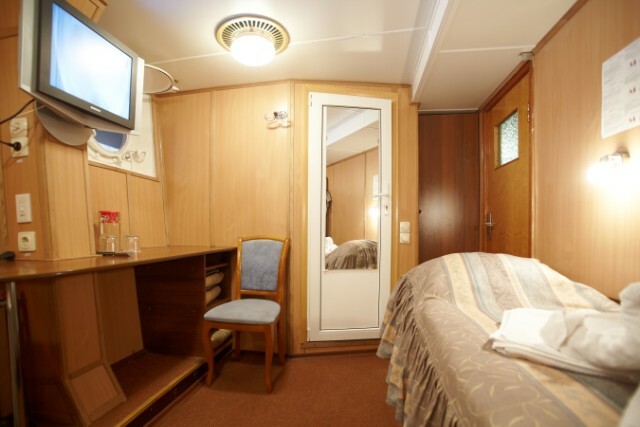 Each cabin includes a double bed, a single bed, restroom (washbasin, shower and toilet), toiletries (shampoo, gel, shower cap), TV, fridge, central individually adjustable air conditioning, hair dryer, individual phone line. 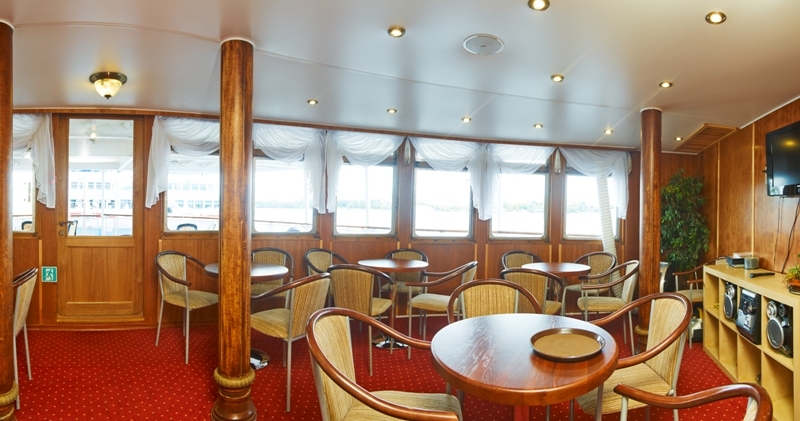 Double cabin with additional bunks (can accommodate up to 3 or 4 people), located on the main deck. 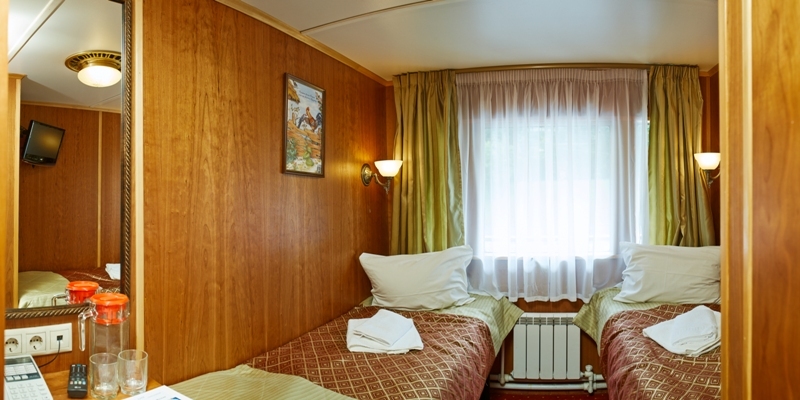 The cabin consists of two single beds with top bunks, restroom (washbasin, shower and toilet), TV, fridge, air conditioner, hair dryer, individual phone line. 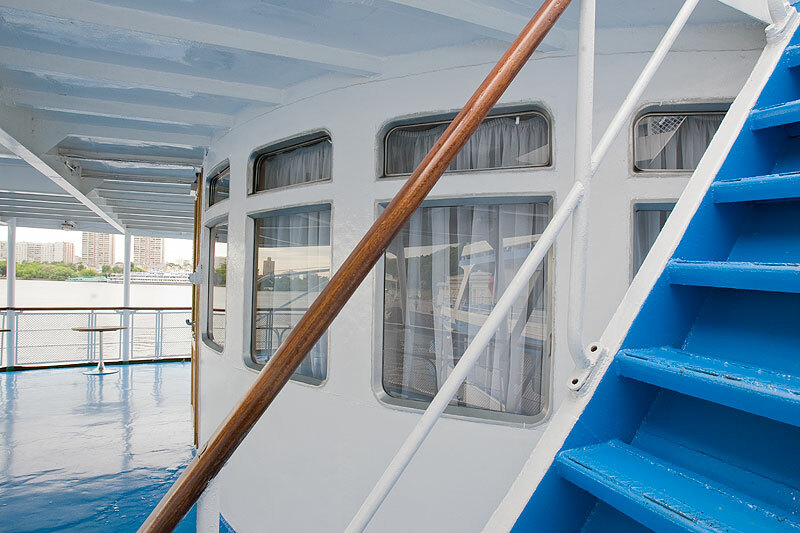 Double one-level and triple double-level cabins, located on the lower deck. 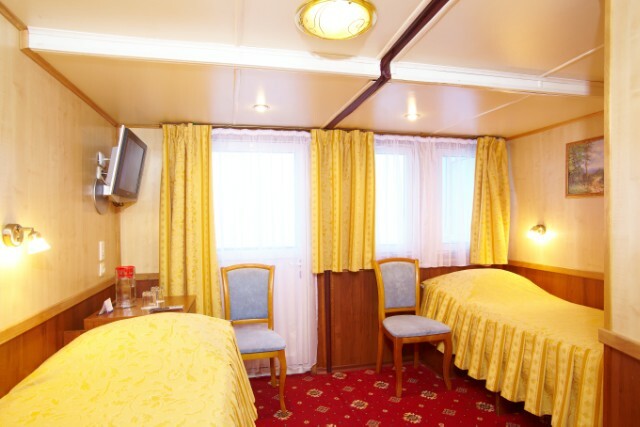 Each cabin includes two single beds and a top bunk (cabins 109, 111, 113), restroom (washbasin, shower and toilet), TV, fridge, air conditioner, hair dryer, individual phone line. 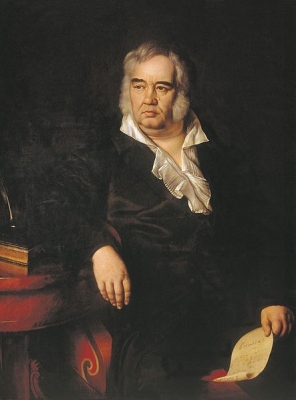 Ivan Krylov was born on February 13, 1769 in Moscow. His father was a military officer who achieved great honors during the Suppression of the 1773-1775 Pugachev’s Rebellion. Krylov spent his childhood in the City of Tver and the Ural Mountains. His family lived in poverty. During his teenage years Krylov had to work as an assistant clerk at the office of a local court. In 1782, Krylov moved to St. Petersburg where he worked as a low-level civil official. Krylov sought to educate himself; he studied literature and mathematics and taught himself French and Italian. At the age of 14, Krylov wrote the libretto for The Coffee Fortune Teller, an opera dealing with the daily lives of provincial landowners. From 1786 to 1788, he completed comedies like The Rabid Family, Pranksters, The Writer in the Hallway. In 1789, Krylov began publishing the Dwarves’ Correspondence journal – a series of satirical messages exposing various abuses on the part of government officials. In 1792, Krylov resigned from civil service and began independently printing another satirical journal – The Spectator. He published his novel Kaib the same year published his novel “Сaib”. Krylov wrote an anti-government comic tragedy Podshchipa or The Triumph. In 1805, he translated two fables by La Fontaine, from there on Krylov worked as a fabulist. In 1806-1807, productions of The Fashion Shop and The Instruction of the Daughters were mounted in St. Petersburg. These were, again, satires of nobility’s attraction to everything French, a fashion trend Krylov detested his whole life. In 1809, Krylov’s first book of fables was published. From 1812 to 1841, Krylov was employed by the Imperial Public Library, first as assistant librarian and then as head of the Russian Books Department. With his fables, Krylov introduced the popular language of ordinary people into Russian literature. Pushkin said of Krylov that the latter possessed “a cheerful yet cunning mind, a spirit of mockery and an ability to express himself vividly”, while Gogol noted that the fables became “a book of popular wisdom”. Many lines from Krylov's fables have become proverbs and are still used to this day.